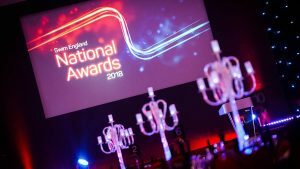 At the 2018 Swim England National Awards ceremony held at Birmingham University’s Great Hall in November, Dorset clubs were once again in the foreground with two of the 32 awards being presented to a Dorset coach and a Dorset para-swimmer. Swim England Coach of the Year was awarded to Barry Alldrick who has enjoyed a successful year at Poole SC, coaching Jacob Peters to the Commonwealth Games and Team GB European Junior Championship swimmer Jasmin McCrea as well as completing the Swim England Coach 2024 programme. On a personal level, Barry was also named as a GB coach for the European Junior Championships and has continued to support Poole’s numerous swimmers attending regional and national championships. In September 2018, Barry was also presented with the South West Coach of the Year Award by Swim England South West Region. Bournemouth Collegiate’s Leo McCrea was one of six swimmers collecting Swim England Talent Athlete of the Year Awards, with Leo winning his award in the Para-Swimming category following a very successful season and making improvements across all events. 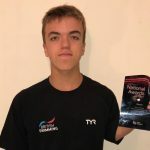 This year, Leo made several finals at the British Para-Swimming International Meet and the British Summer Championships, together with setting new personal best in the 400m Freestyle and 100m Breaststroke and progressing each year while on the England Talent Programme. Leo is now on the British Para-Academy, the first step on to the World Class Podium programme. 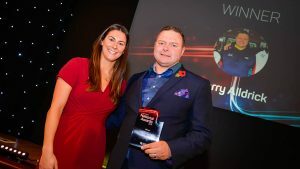 Photo (right): Barry Alldrick receives the Swim England Coach of the Year 2018 Award from Aimee Willmott, 2018 Commonwealth Games 400m Individual Medley Champion.